Qualcomm’s Quick Charge and OnePlus’ Dash Charge technologies have set a high benchmark when it comes to juicing up smartphone batteries in a very short span of time. But their supremacy will soon be challenged by Chinese telecom giant, Huawei, which has demoed a new fast-charging technology which can top up a smartphone’s battery from 0-48% in a just 5 minutes. Huawei’s official YouTube channel recently posted a video which showcases the company’s ‘next-gen quick charge’ technology, and believe me when I say this, it’s way faster than any fast charging implementation out there in the market. I mean, how often do you hear about a fast-charging standard which can juice up a smartphone’s battery from nil to almost half in just 5 minutes? And yet, that’s exactly what Huawei has accomplished with its latest creation, charging a battery from 0-48% before you can finish your cup of coffee. But there is a small trade-off. 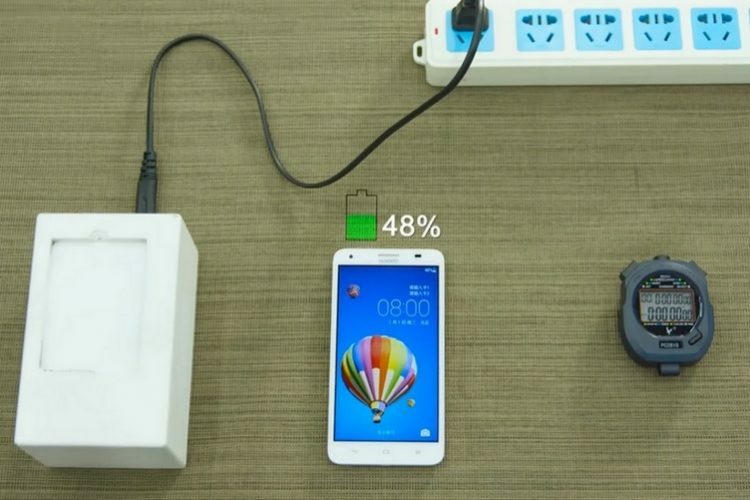 The fast charging technology showcased in the video requires the battery to be taken out and placed in a separate charging pod to energize it. And how many flagship smartphones can you actually find in the market that feature removable batteries? You’d have to go back a few years to find those. However, it might be possible that Huawei can overcome the shortcoming and somehow make the technology feasible for modern smartphones, even those with unibody construction. The team at the Huawei Watt Lab has developed this super fast charging technology by altering the molecular structure of the material used to make the anode through physical and chemical methods. The aforesaid modification allows the batteries to achieve high charging efficiency without compromising on the battery life. Even though the video does not reveal any information regarding the market arrival of Huawei’s fast charging technology, reports suggest that the Chinese smartphone maker might showcase the technology at the MWC 2018 next month. And if that turns out to be true, Huawei will surely usher a new era of smartphone charging technology, and for a while, it will be the undisputed leader of the domain.